Several years ago, I was looking for highly-regarded recent cosmic horror novels. 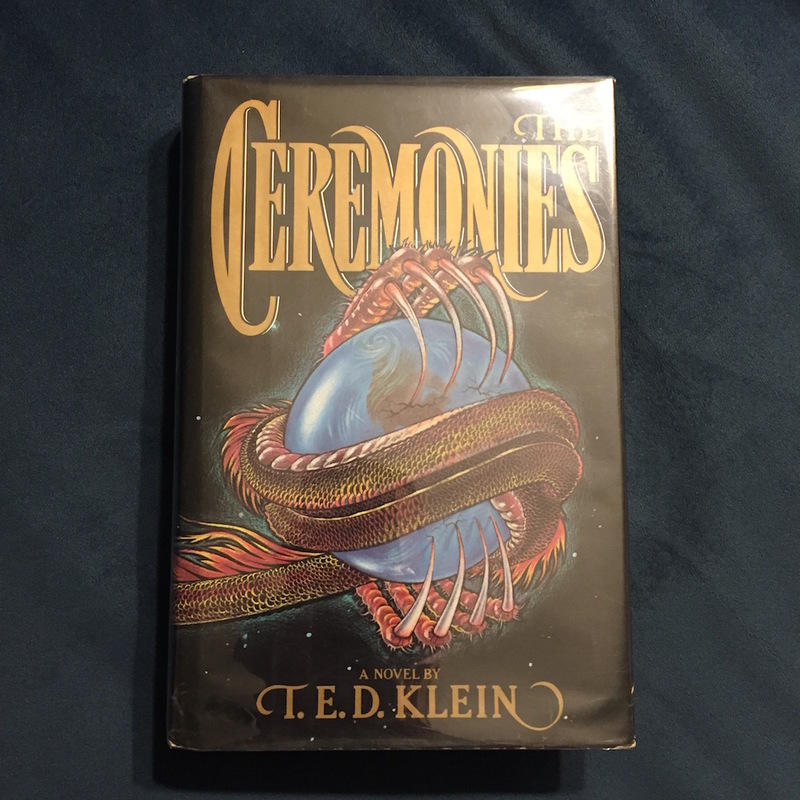 I asked online and somebody recommended T. E. D. Klein’s novel The Ceremonies. I finally started reading it a few months ago, somewhat distracted by other books and priorities, but made my way through it slowly and finally finished in a few days ago. One way of looking at The Ceremonies is as a 500-page callout to others in the know. The primary viewpoint character is a young, unaccomplished assistant professor of gothic literature, Jeremy Freire. Jeremy regularly discusses the various horror novels that he is reading to prepare a syllabus for a class he is planning to teach. This device allows Klein to drop literal references to the existing corpus of cosmic horror and its genre predecessors. Some key works within this literature even serve as diegetic plot elements, such as a short story by Arthur Machen. Because of this, The Ceremonies itself works as a syllabus of cosmic horror or strange tales. Readers who enjoy this tradition of cosmic horror will recognize many formulaic elements. That may sound like a criticism, but the formulas are used skillfully and the writing act itself (on Klein’s part) almost seems ritualistic to me. Even the mostly-wooden characters are in keeping with Lovecraft. While I never really sympathized with any of them, they worked as archetypes with just enough individuation to keep my interest. Daniel Day Lewis would make a good Sarr, a farmer who is one of the main supporting characters. The plot is slow and meandering. It is skillfully crafted enough that the events generally did not feel contrived to me in the moment, but when viewed from a high level the story does rely on several somewhat unsatisfying coincidences. The plot exists primarily to support a mood, however, and the mood is effective. At its best, The Ceremonies has some of the best horror writing I have come across, especially the way that Klein is not afraid to use classic elements where they serve his purposes, which I appreciate. The parts of the story I enjoyed most were the evocations of mysticism and the carefully detailed monstrous elements. Klein never falls into the trap of Lovecraft-inspired cliches, there are no tentacles to be seen, and his horrors never seem taxonomic. Due to the almost inbred nature of the allusions and references, readers who are not members of the Lovecraft fanclub subculture may find the length trying. That said, my overall reaction is favorable. The Ceremonies is Klein’s only novel, though he also has a collection of novellas (Dark Gods) that I am now interested in reading at some point. Supposedly, he has been working on another novel called Nighttown for 30 years and it may actually be published soon. This entry was posted in Reviews and tagged cosmic horror, literature on December 28, 2016 by Necropraxis. Though I heard about the first Kingdom Death Kickstarter when it launched in 2012 and adored the aesthetic, A) I do not really play board games and B) I had no experience assembling miniatures. So, I passed. However, after seeing some of the models in the wild, I took advantage of the Black Friday 2015 opportunity and bought a copy of the core game along with the Sunstalker and Flower Knight expansions. The game arrived early January 2016 and then it sat on my shelf unassembled for almost a year. The 1.5 reprint/update Kickstarter prompted me to actually attempt assembly. 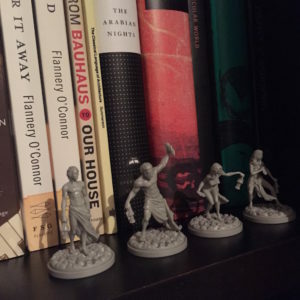 It took me a few weeks to assemble the four prologue survivors and all the core monsters. It is surprisingly hard to find a concise description of the game. Here is my attempt. It is a cooperative campaign board game where four survivors wake up barely clothed in an unlit land. The ground is all stone faces. The survivors hunt monsters for resources and found a settlement near a pile of creepy lanterns. Players grow the settlement, building structures, developing innovations, and reproducing. They stave off inevitable entropy for as long as possible. Gameplay alternates between tactical combat and settlement building. More specifically, after the first story prologue fight that introduces basic concepts, the cycle is settlement, hunt, and showdown. This cycle constitutes one lantern year (the time it takes one of the creepy settlement lanterns to burn out). A full campaign in the core game is 20 lantern years. I think a reasonable real-world session would be one or two lantern years generally, but I do not yet have extensive experience. During my first play (we were four players), we did the prologue and lantern year one. This took about four hours but included taking cards out of shrink and looking up lots of rules. I think it would be significantly faster the second time. Note that you also have to assemble some miniatures first, though you can get by with only the white lion and four survivors to begin with (see remarks on assembly below). Showdown Phase. The showdown phase (where you fight monsters) is straightforward two-dimensional tactical combat. Move some spaces, take an action. The showdown board is small enough that it seems like few turns would be movement-only (I consider this a good thing). Players rotate controlling the monster though the monster controller needs to make few decisions as the monster actions are mostly dictated by an AI deck. In addition to the AI deck, each monster has a hit location deck which controls various monster reactions. 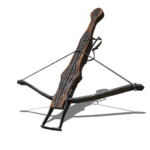 After survivors hit, they must confirm damage as well (accuracy adds to hit, strength adds to confirming hits). I was worried at first that this might result in many turns where engaging multiple resolution systems would lead to no overall effect, but in practice that did not seem to be a problem. 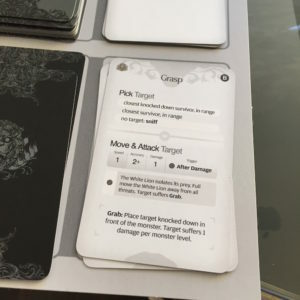 A monster-specific resource deck controls the resources that the monster could potentially yield. Actual drops are determined mostly randomly, though some hit locations give access to specific resources. If the survivors defeat the monster, they scavenge resources which can be used to build things during the settlement phase. Some monster fights use terrain pieces to increase the arena complexity. Overall, the tactical combat is simpler than 4E D&D, one of my few points of comparison (I consider this a good thing). Monster AI. The AI deck also doubles as the monster health score which means that the monster actions become less variable and potentially more predicable as survivors wear it down. The AI deck system also means that the same monster can be reconfigured in many ways with differing difficulty. For example, we fought the white lion twice, during the prologue and the first hunt. The AI deck construction was different between those two and the construction incorporated randomness. The lion we hunted (level one) had 7 basic and 3 advanced AI cards, randomly selected (this also meant that it had 10 health, though note that you need one final hit to take a monster down after that total is depleted). For me, the AI deck is probably the most compelling game design I have seen so far in Kingdom Death. It is approachable from a player standpoint but seems to generate a lot of emergent complexity. There are many lessons here for D&D monster design, probably best realizable through sets of tables. Hunt Phase. Between settlement phases survivors can go on a hunt, though this is not the only way to encounter monsters (encounters can be caused by settlement events also). The hunt, which hopefully culminates in a showdown (briefly described above) plays out on a one-dimensional track where events occur on the way to the monster. In our first hunt, one of our survivors was terrified to death by the screeching and yowling of a lion in heat so we went into the lantern year one fight with only three combatants. This could mean that one player might be out for the showdown. 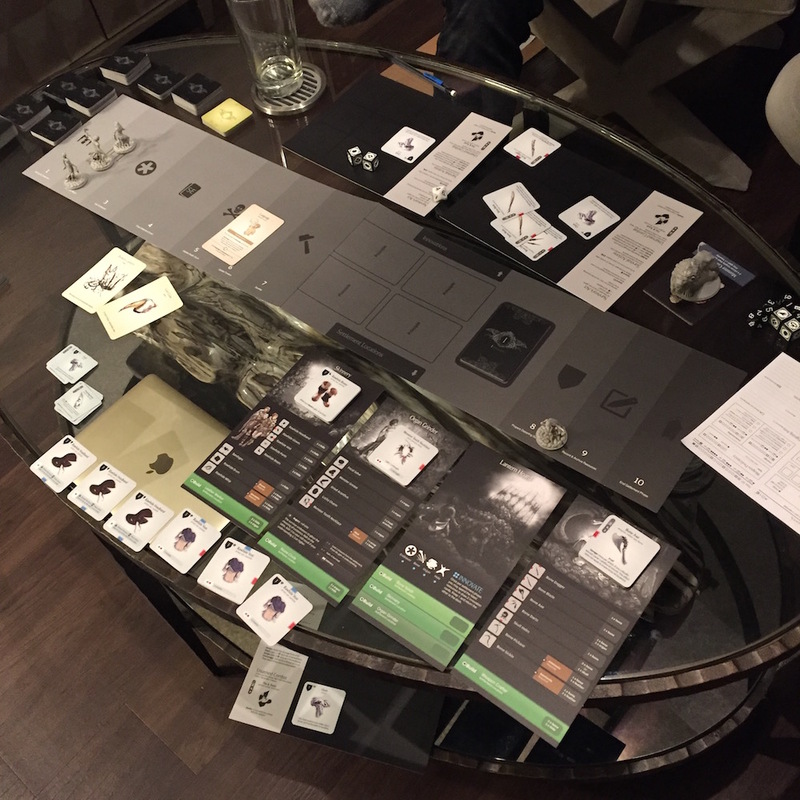 The game is collaborative enough that it might still be fun, but I am not sure (we did the prologue fight with four players but were down to three anyways for the first hunt and showdown). 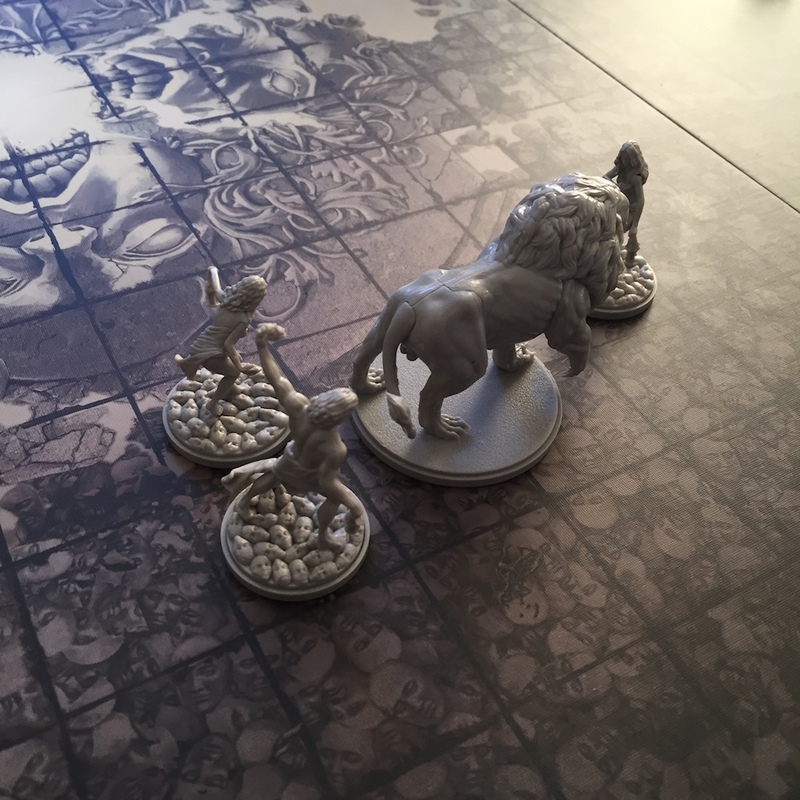 Our first lion hunt ended in a TPK. Since there are still some other survivors left in our settlement, the TPK is not game over. Settlement phase. In some ways the payoff to playing Kingdom Death is the settlement phase. It is sort of like a fun, collaborative, non-homework version of building a character in games that require complicated character builds. However, unlike complex character building, success in the settlement phase depends not on voluminous knowledge of the rules text and combos, but rather on success during previous showdown phases and a few choices about what to prioritize. Also, as discussed below, I think that the settlement is the primary fictional element of play in Kingdom Death, not the survivor. As you can see in the image to the right, the settlement phase also has its own board, which similar to the hunt board is a one-dimensional track that walks players through the procedure. The survivor is not the primary element of play in Kingdom Death. The settlement is. When you lose a survivor, that is a setback but the settlement’s remaining population acts as a buffer (and the slain survivor’s gear is not lost but automatically returned to the settlement). As I understand it, settlement wipes are certainly possible (though I do not know how common). If you would be frustrated by such a loss after, say, 20+ hours of in-person play rather than experiencing it as the dark closing chapter of a story to remember, this might not be the game for you. One strain of traditional D&D play is similar to this approach, where the setting and adventuring party are the first-order units of play and the adventurer is, while not disposable exactly, at least not central. I have run games like this before and participated in them and I think that this approach offers a unique potential for engaging play. In such a game, impartially resolved catastrophic failure is possible but not fatal to the campaign, increasing the potential stakes of decisions. 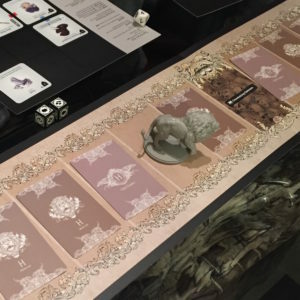 Kingdom Death is a far more focused game than D&D but it provides examples that could be adapted to a D&D game centered around developing a party or settlement. In fact, I do not think it would be that hard to run an OD&D game using many Kingdom Death mechanics directly, perhaps replacing magic items and treasure with resource drops and settlement crafting and adapting monster decks to D&D monsters. 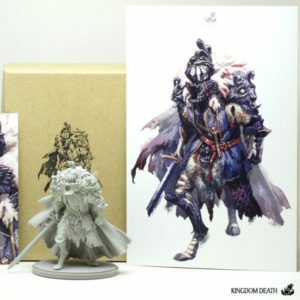 Beyond gameplay though, the aspect of Kingdom Death that originally drew my attention, and sustains my interest, is the aesthetic and setting which reminds me of two of my other favorite fantasy franchises, Berserk and Dark Souls. This is not that surprising, as I understand that Berserk is an explicit influence on the designers of Kingdom Death. These three, Berserk, Dark Souls, and Kingdom Death, make up what is for me a dark fantasy trinity. All three have complex, well-designed, internally consistent worlds with ultimately ambiguous canons. There is enough detail to keep my interest but not so much that the audience ever really knows exactly what is going on. The world of Kingdom Death is an endless plain of stone faces lit occasionally only by lanterns. Why? Where did the survivors come from? Who knows? Despite the detailed and baroque monster design, all three of these franchises also have an ultimately restrained sensibility that rests more on mythical resonance than raw newness. None of the three franchises are shy about recruiting cliches, but the cliches are never used thoughtlessly and often adjusted (though never entirely subverted, which I also appreciate). They say if you take a lantern that never lit down the trail of corpses and past the whispering stars you will find an ancient figure atop a crest of determined faces. Treasured by a hidden cult of loyal squires, the figure will awaken for only the most honorable of challengers. 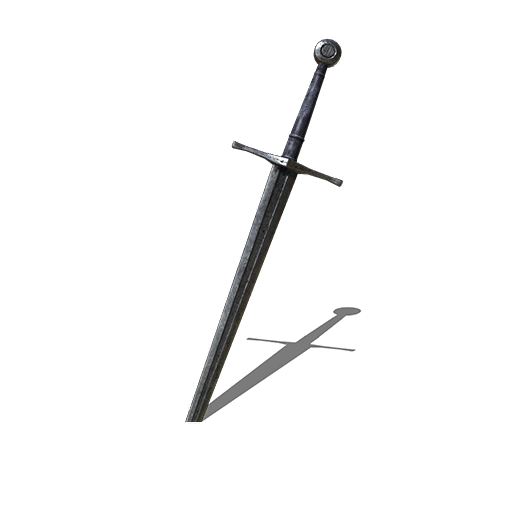 For generations, the Black Knight has unknowingly defended a settlement of people hidden in the ruins of its home. These were the first miniatures of any kind that I have ever assembled. As noted above, the mini parts come attached to sprues as cast in the factory and must be clipped out. There are no official instructions, but I found the guidance on Vibrant Lantern satisfactory except for the phoenix and the watcher. I used this one for the phoenix and this one for the watcher (both linked to from Vibrant Lantern). For general advice, I found this conversation useful. Several issues tripped me up that might be obvious to experienced model builders. Below I address some of these issues. Hopefully that will be useful to other gamers with similar levels of experience. Tools. You need to buy at least two things to assemble the minis: sprue clippers (I got Citadel Fine Detail Cutters, $35) and plastic glue (I used Plasti-Zap, $4). A model file would be helpful to clean up join points but I did without. Another useful tool that I did get was a clamp (Irwin One-Handed 6″ Bar Clamp, $12). Glueing. The plastic glue begins to set quickly as long as you do not jostle the pieces, so the technique I found most useful is to find a way for gravity to hold the parts together so that you can go do something else (the clamp can help with this). To be safe, I generally attach a few parts and then let them fully dry overnight before adding anything else. You can have multiple models in progress, but do not clip parts before you are ready to attach them because it would be easy to mixup or lose parts. Assembly was time consuming in a hurry up and wait manner but not exactly difficult. I found the absurd complexity of the process somehow motivating. I used up a full ⅓ oz bottle of Plasti-Zap to assemble four survivors and all seven of the core monsters, so I would recommend buying more than one bottle of glue. Basing. Each mini base is two parts: bottom and inset. The core game comes with a small number of special face inserts. This is just a cosmetic detail, but you will not have enough for all the minis. 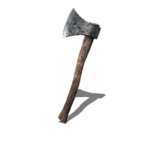 I used four of them on the prologue survivors. Hopefully, the 1.5 Kickstarter will include an add-on to get more face inserts. See discussion of stone face bases here and here. There is no special correct placement of minis on bases. Just glue them on however looks reasonable. Gaps. While most of the parts fit together well, if you are anything like me you will still end up with some fit gaps in the assembled models. The phoenix was the biggest offender here (use more clamp, I guess). I have heard good things about Tamiya Basic Type Putty (which is itself gray) and so will likely look better than Green Stuff before painting. I have not used either of those myself yet. I have not yet used any of the expansions in play, but as I understand it several of the expansions offer alternate campaigns (Dragon King, Sunstalker, and Flower Knight) while others offer monsters that can sub in for core game monsters. The Gorm can be hunted early on (otherwise the White Lion is the only monster that can be hunted during the first few lantern years). The Lantern Festival, which was intended to extend a campaign past 20 lantern years, was cancelled because the designer was not satisfied with how it worked. The Lantern King model is amazing though, so I hope it becomes available in some form. The upcoming Nightmare Ram (available through the new Kickstarter) is intended to offer some sort of dungeon crawl experience. See here for more. It looks to me like the game should play just fine with no expansions. The core game alone, if you dig the style, should provide lots of replay value. Play was smooth and none of the phases were that complicated. The hardest part of playing the first time is finding the various kinds of cards (there are a lot of different kinds of cards). A few of the mechanics seemed like they could be streamlined in minor ways. 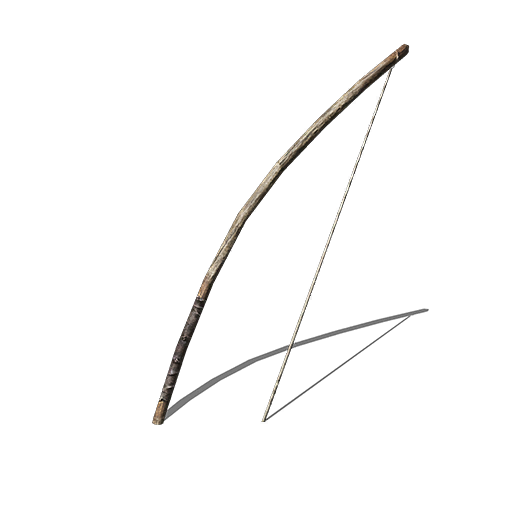 For example, weapon and monster accuracy is a target number (used to hit) while strength functions as a bonus that is compared to a toughness target number. Both kinds of stats can have bonuses and penalties. It is also easy to get a few of the stats mixed up (strength versus accuracy, movement versus speed, and so forth). I never felt like there was choice paralysis, even when we were making decisions about items to craft during the settlement phase. I can see how that might change as you build more settlement locations and have more kinds of resources to draw on but hopefully the complexity increases gradually. I am not yet sure which elements of the game are best served by cards and tokens as opposed to just writing things on record sheets, but so far I am enjoying the physicality of everything. 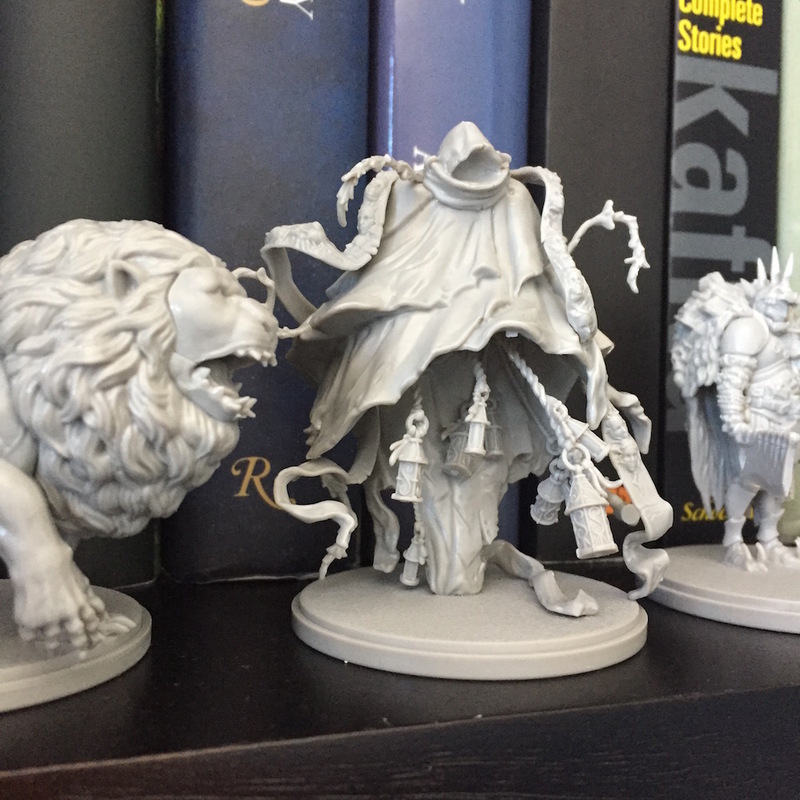 At this point, I am kind of a super-fan of both the world and game mechanics, but I am not blind to the fact that there are a number of drawbacks which make Kingdom Death a big commitment and probably not for everyone. Chris Handley’s videos with Beasts of War are the only decent actual play videos I have found. They have so far released lantern year one, lantern year two, lantern year three, lantern year four, and lantern year five (I have not watched all of them yet). Chris’s Instagram has many nice examples of painted models too and is worth checking out for inspiration (and check out his amazing hair!). First, I am far from a Kingdom Death expert. That said, I have assembled all the core game monsters and played it, so I can speak to some aspects of setup and play. 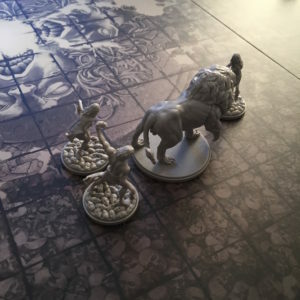 Hopefully the fact that I am neither a diehard board gamer nor a miniature person might help me speak to other similarly casual gamers that nonetheless find the Kingdom Death vision compelling. Second, I am backing 1.5 for the upgrade pack and some expansions. This entry was posted in Reviews, Spotlight and tagged Kingdom Death, miniatures on December 20, 2016 by Necropraxis. I was looking through my blog drafts folder, and came across several unfinished posts related to my Pahvelorn OD&D campaign (which has been on hold for several years now). This is one of those posts. If it feels somewhat out of left field, that is why. This is a fun item though, so I thought it still worth sharing. In that game, one faction is a group of borg-like demonic invaders. They look like a mixture between Lord Zedd, Giger’s alien, and matte black humanoid crabs. They are highly organized, militaristic, and woven into a psychic mesh which allows telepathic communication. They cannot speak human language but at some point during the game one of the adventurers managed to communicate telepathically with a drone that had been separated from the central consciousness. I described the experience as a series of tangled visual signs and from then on the players referred to the creatures as Tangles. A tangle drone’s exoskeleton can be worn as armor if properly extracted. There are two varieties of tangle armor, soft-shell and hard-shell. Soft-shell: AC as medium armor, 5 . Hard-shell: AC as heavy armor, 3 . Anti-Disintegration. Wearers of tangle armor are immune to disintegration. Rejuvenation. Following combat, tangle armor will heal 1d6 points of damage. This only applies to damage just suffered. This causes a head rush in a human wearer. Pincer-Claws. Tangle armor appendages count as armaments (standard 1d6 damage). They also have 18 strength in terms of grip (think alligator jaws: easy to hold closed, hard to pry open). These pincers surround hands but do not interfere with standard hand uses. Creepy. Wearing tangle armor results in a functional charisma score of 3 when interacting with civilized others. Receptive. Wearers suffer disadvantage (such as -4 penalty) when resisting psychic attacks. Armor wearer is psychically attached to the tangle hive consciousness. Armor wearer becomes unable to perform aggressive acts toward creatures with 4 or 6 legs/arms. 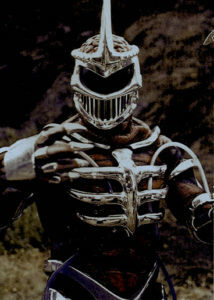 Armor wearer’s mouth and larynx are replaced with a mandible-like mechanism that prevents speech. Spells may still be used though interpretive dance. This result is permanent even if the armor is successfully removed later. Armor wearer secretes colony spores whenever resting. There is a 1 in 6 chance that the resting place will become a new hive shortly thereafter. This hive is autonomous from the mother hive on tangle world. Armor wearer becomes a beacon. There is a 1 in 6 chance that a gate will open to tangle world every time the armor wearer rests. The gate will be located in a secluded area within one mile of the rest point and will remain open for one week. The armor fully infiltrates the wearer’s body, rearranging parts, integrating with organs, and improving resilience. Armor wearer gains one HD permanently and no longer requires oxygen but will collapse into a pile of disaggregated flesh if the armor is ever removed, even with a “safe” spell method. If the saving throw succeeds, putting the armor on has no side effect other than being permanently integrated with an alien exoskeleton. Removal. 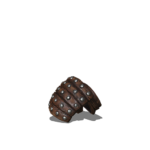 Tangle armor may be removed from a human safely only with dispel evil (this destroys the armor) or remove curse (after which the armor may be worn by another). The armor may be removed forcefully or in a nonconsensual manner (if the wearer is restrained). 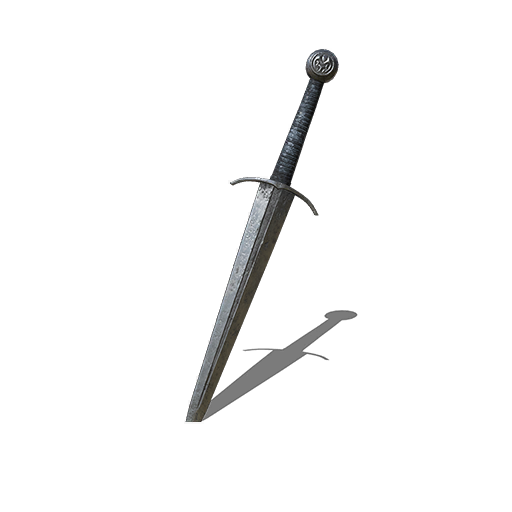 This causes the wearer 3d6 damage (save versus stone for half). Spell-based removal does not protect the wearer from bodily disaggregation based on result 6 above. Extraction. Defeating a tangle drone in combat damages or destroys the armor. Functional tangle armor can only be extracted from captured, living drones. Extraction kills the drone unless the extractor takes extraordinary measures. Tangles have stats as hobgoblins with supplementary abilities consistent with the armor description above. In any raiding party, at least one drone will be armed with disintegration weaponry. Mounts and vehicles are hover platforms that can be psychically controlled. Tangles may be remote-controlled using telepathy (drones get a save to avoid, connecting to the hive mind risks alien psychic mental control and insanity). 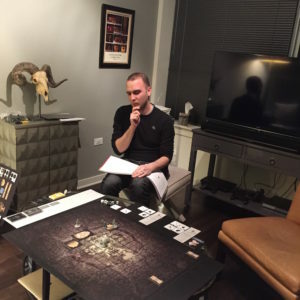 This entry was posted in Campaigns and tagged monster, OD&D, Pahvelorn, treasure on December 18, 2016 by Necropraxis. The playbooks inspired by Dark Souls that I am developing for my current Stonehell game do not include traditional attack bonuses derived from class and level. Ability bonuses do contribute to attack competence, and ability scores do improve with advancement, but the scope of bonuses is the stingy B/X +0 to +3. 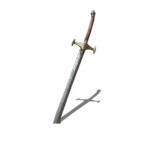 To fill the game role of the attack bonus, Adventurers may enchant weapons. 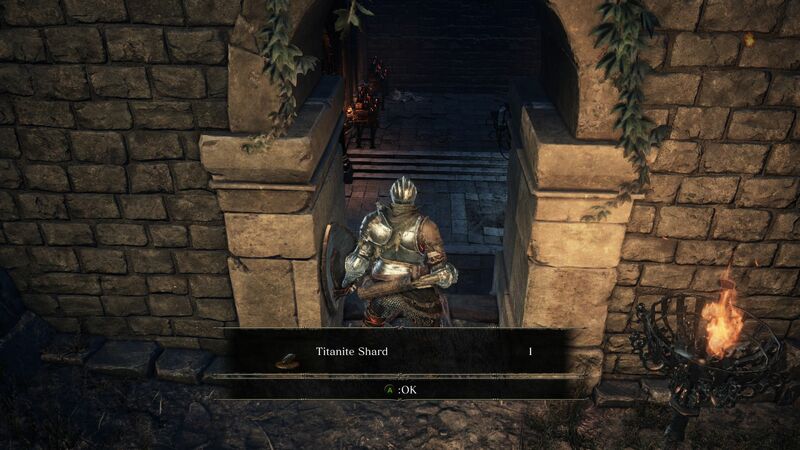 I envision a mechanism similar to that of Dark Souls, where players gather item drops such as titanite shards from monsters and then pay smiths to improve weapons using those resources. To gather Monster Parts as resources for later use, Adventurers can use the Scavenge Dungeon Move if there are monster remains available (such as following successful combat). In the Hazard System, Adventurers take Dungeon Turns to make Dungeon Moves. Some example defined moves are Climb, Explore, and Search. This is similar to the various traditional D&D X in 6 checks, though more formalized. In practice, players often need not declare Moves explicitly (though they can), but, for example, the referee will naturally interpret moving from one dungeon area to another as the Explore Move and call for a Hazard Die throw. 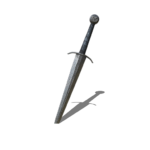 Making Scavenge a Move means that players expend dungeon time in exchange for weapon improvement resources. Monster Parts can lend additional properties to weapons, such as fire enchantment from fire monsters. Improvise Monster Parts properties using common sense. There is no need to preemptively design a complicated taxonomy. For example, assuming traditional monsters, Monster Parts Scavenged from giant centipedes might be Poison Monster Parts. To increase the difficulty of improving weapons, have only uncommon or rare monster corpses supply useful Monster Parts. I think allowing brutal weapons or creepy upgraded weapons to be built out of common orc or skeleton parts could be fun though. I generally prefer to make just about all possibilities open to low-level characters so I plan to follow the second route (making all monsters provide Monster Parts). For simplicity, do not differentiate between monsters with regard to quantity of Monster Parts available. One Adventurer Scavenges Monster Parts from one monster with one Dungeon Move and that exhausts the monster carcass. Specific or unique monsters may be exceptions to this rule. Six parts per Gear Slot seems like a reasonable default for encumbrance, though this is also something that can easily be adjusted by situational ruling. 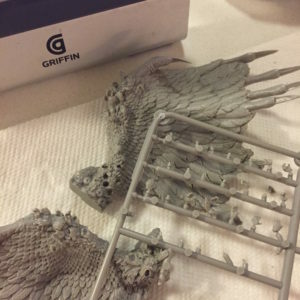 Maybe dragon Monster Parts take up a full slot per part. I am planning initially to make Scavenge success depend on a Wisdom Check. Make the check, gain 2 Monster Parts. Fail, gain 1 Monster Part. Critically succeed, gain 3 Monster Parts. Critically fail, spoil the remains. A critical success is the best result from the d20 or success by four or more.This follows my general approach for d20 partial success, based on the OD&D purple worm swallow mechanic. In shorthand, gain degree of success +1 Monster Parts. Alternatively, substitute some system other than a Wisdom Check to determine Scavenging effectiveness, or just grant a unit of Monster Parts for spending a turn and enduring the roll of the Hazard Die. A simple d6 roll would work, avoiding the influence of ability scores, as would an Apocalypse Engine 2d6 roll with success thresholds at 7+ and 10+. Time passing and resource attrition are the important trade-offs. 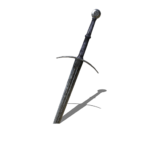 Since enchanted weapons are powered by the Adventurer’s soul, improving weapons early in the game need not flood the fictional world with glowing +1 swords. How many Monster Parts are required to upgrade a weapon and how much does it cost? That seems like a topic for another post and will probably require some experimentation and adjustment during play testing. This post has gone long enough. To end, have a formal rule in the Hazard System style. To Scavenge the corpse of a defeated monster, make a Wisdom Check, scavenging Monster Parts equal to the degree of success + 1. Note any special Monster Parts properties, such as poison, slime, or fire. This entry was posted in Rules and tagged Dark Souls, Hazard System, Stonehell, underworld on December 16, 2016 by Necropraxis. 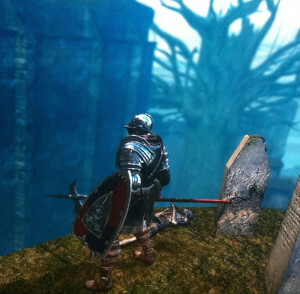 Blocking and dodging are an iconic part of Dark Souls combat. While I do not want to model Dark Souls combat entirely, I do want to inject some of that feeling while maintaining the randomness necessary for engaging B/X combat and also not changing the core combat engine or making it significantly more complicated. The Shield Block and Dodge reactions replace the monster attack roll and so must be declared prior to throwing the monster attack roll dice. 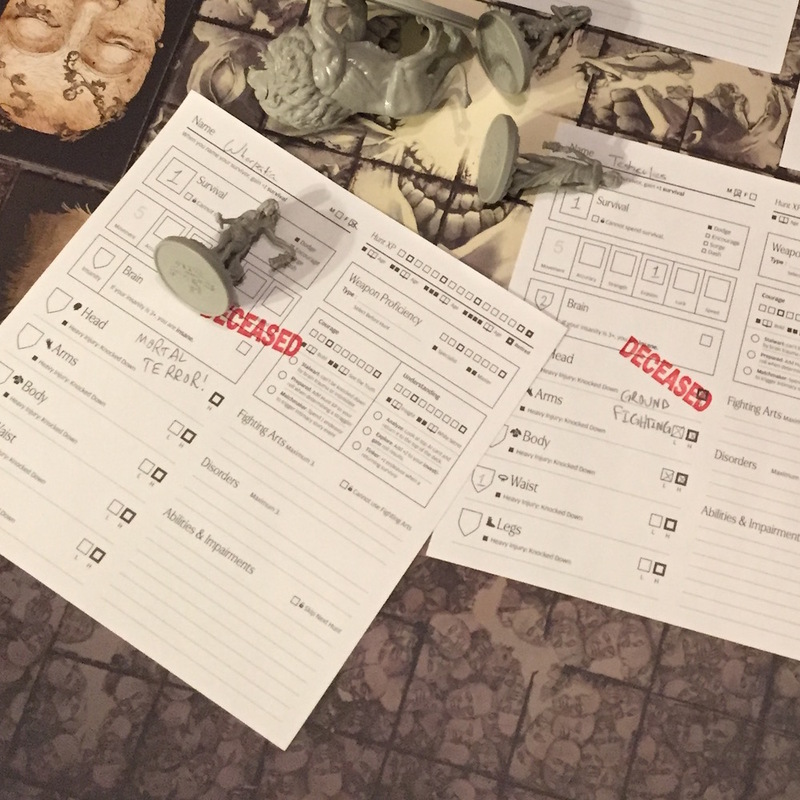 When a monster attacks, the referee should say to the adventurer player (paraphrasing): the monster is attacking you, do you want to block or dodge? and then proceed with the appropriate procedure. The approach outlined below in essence allows the player to use strength or dexterity as their defense stat, instead of armor class. This also eliminates the effect of the monster attack bonus, and so will often, especially for particularly fearsome monsters, be probabilistically advantageous. The downside is that blocking or dodging risks running out of stamina, represented by a constitution check. This trades chance of near future danger for immediate benefit. Characters that are out of stamina are sluggish and do not fight as effectively. 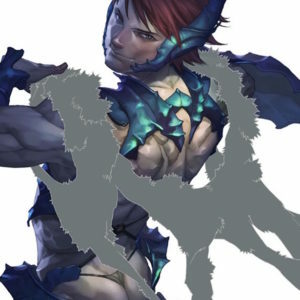 They may not block or dodge and make all physical rolls, including attack rolls and ability checks, with disadvantage. Blocking is more effective (even when the strength check result is failure the adventurer suffers less damage) while dodging consumes an adventurer’s per-turn movement allowance. Some attacks are difficult to block (strength check success → half damage, strength check failure → full damage) or impossible to block (suffer full damage no matter what). Players must discover which attacks are able to be blocked through play. In general, this should follow common sense; don’t try to block a giant’s club. To block an enemy’s attack, make a strength check. On success, suffer no damage. On failure, suffer half damage (round up). Also make a constitution check to avoid running out of stamina. Make STR check (failure → ½ damage) and CON check (failure → out of stamina). To avoid an enemy’s attack, make a dexterity check. One dodge can avoid multiple enemy attacks if fictionally reasonable. An adventurer may not move after dodging on a turn during which the adventurer dodged. Make DEX check and CON check (failure → out of stamina). Avoids multiple attacks. To recover stamina, spend a combat action. Make all physical rolls with disadvantage. Blocking and dodging are impossible. Stamina recovers automatically following combat. 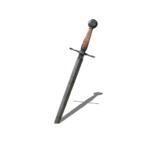 This entry was posted in Rules and tagged combat, Dark Souls, fighter on December 2, 2016 by Necropraxis. Here are Summoner and Pyromancer playbooks—see downloads page for PDFs. 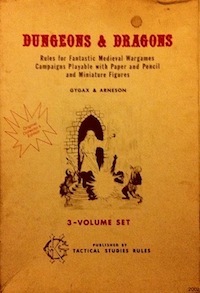 The playbooks include instructions for creating an adventurer along with core rule cues. Below are slightly more precise spell rules. This summoner is a tightened up version of the OD&D summoning rules I posted a while back. As a reminder, intelligence checks control how many times an adventurer can cast a spell. After casting and resolving a spell, the adventurer makes an INT check. Failure means the adventurer looses the spell. Spells refresh during downtime. To cast summoning spells or use magic, adventurers must have a catalyst in a hand slot. Bind a neutral or friendly creature as a minion. Hostile creatures and creatures of higher level than the summoner get a saving throw. Minions resist commands that are suicidal or anathema. Compel resisting minions with a CHA check. Failure breaks the charm. Previously charmed creatures become hostile when liberated. In a puff of smoke, a monster appears. Determine monster randomly. Choose: careful, reckless, or named. Careful results in a monster with level not exceeding the summoner’s. Reckless could summon anything, even a duke of hell. Named summons a creature by true name, which must be known. Optional: choose a minion specialty. Summoners with a specialty may opt to summon minions of the chosen type during any particular summoning occasion. When summoning in this manner, determine specifics of summoned creature randomly within desired type. Once chosen, the specialty may not be changed though summoners may acquire additional specialties through play. Draw a boundary, either circle or line, on the ground with a catalyst. Summoned or extra-dimensional creatures may not transgress this boundary. To cast pyromancy spells, adventurers must summon a pyromancy flame. Adventurers knowing pyromancy spells may summon or dismiss pyromancy flames as an action. 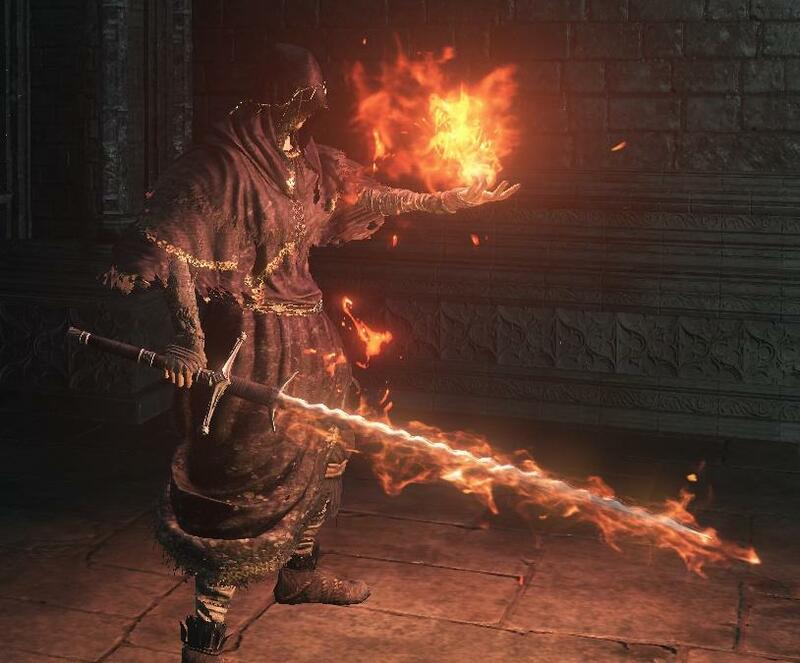 A pyromancy flame occupies a hand slot. Pyromancy flames are fist-sized, hovering, smoking spheres of dim pulsing fire that smell acridly of sulfur and seared tar. They shed about as much light as a dying ember. The odor makes concealment difficult. Deal 1d6 + (1d6 × Level) damage (save for ½) to all in an area. Ignite a weapon. Weapon deals +1d6 damage and damage is magical. The enchantment persists as an expiring resource during exploration. This entry was posted in Rules and tagged Dark Souls, magic-user, Stonehell on November 30, 2016 by Necropraxis. Combat house rules are hard to remember in the heat of the moment, so these are designed to augment traditional B/X procedures. If players do not learn the options or forget to use them, the game will not be much harmed. Applying these procedures should help create the feel of Dark Souls tactics to the degree permitted by traditional tabletop RPG rules. The final playbooks will also include reminder cues to help players. 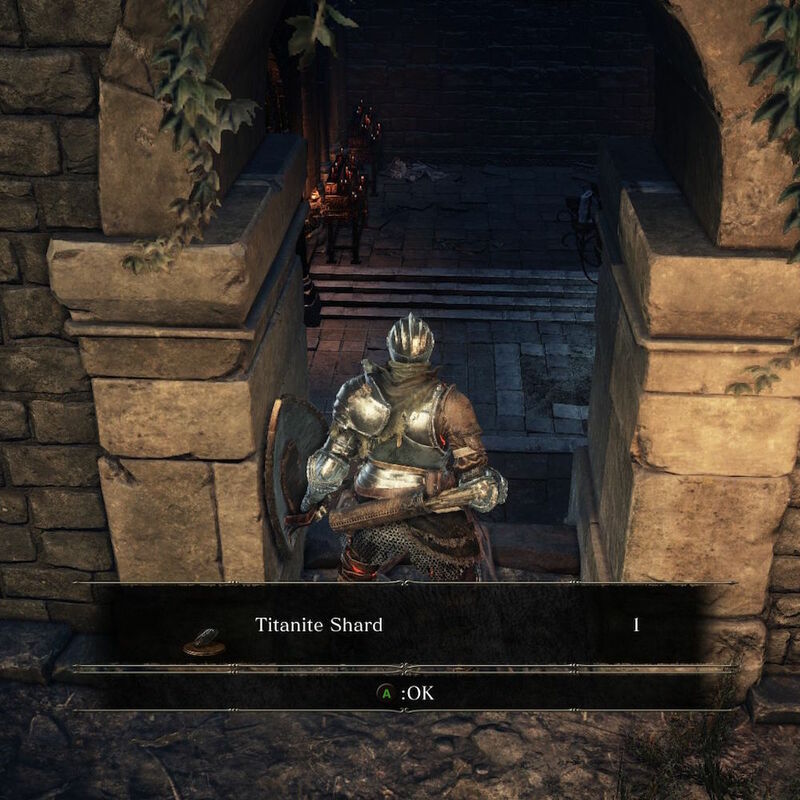 I tried to keep new rules to the absolute minimum required to support basic Dark Souls actions. For now, shields just grant the standard traditional +1 AC. A Dark Souls emulator deserves better than that, but I also do not want it to slow down combat or make adventurers too tough. I do not like rules that allow adventurers to sacrifice a shield to avoid a hit. 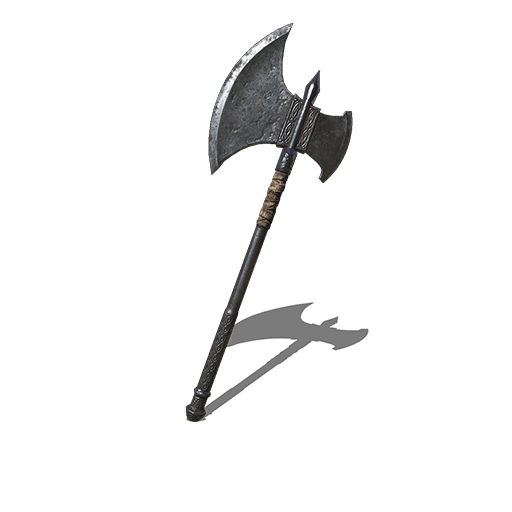 All playbooks provide an initial melee weapon proportional to starting strength. Some provide a missile weapon as well, proportional to initial dexterity. The instructions section of each playbook includes available initial weapon choices. 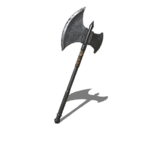 See below for a compiled list of starting weapons. 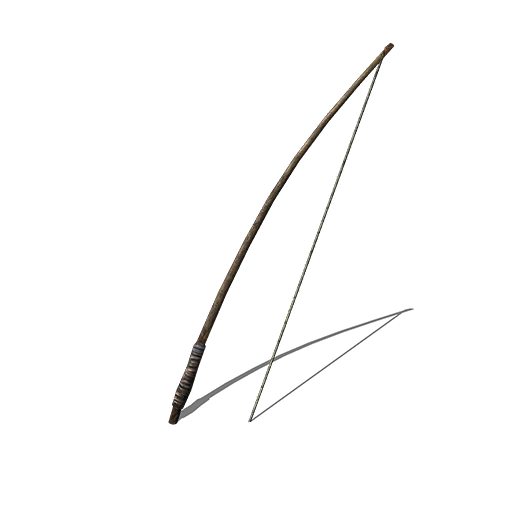 Adventurers with an ability score high enough to use a weapon may wield it one-handed. Some weapons may be used two-handed to deal extra damage. 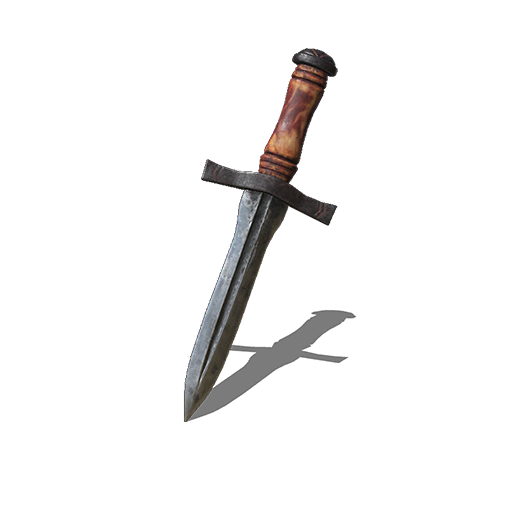 When using a melee weapon two-handed, roll two damage dice and take the larger result (that is, roll damage with advantage). 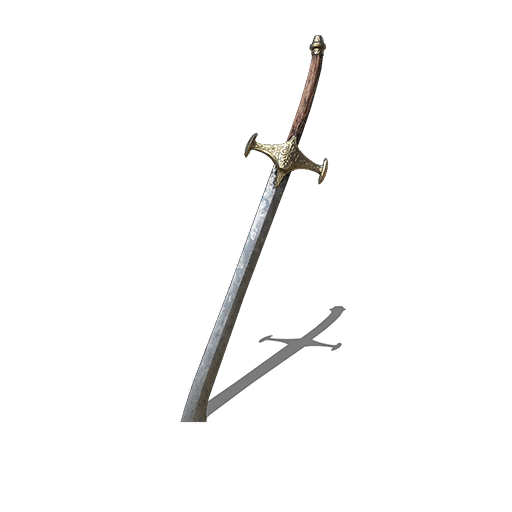 Adventurers may wield a weapon in each hand, allowing two attacks per combat turn. 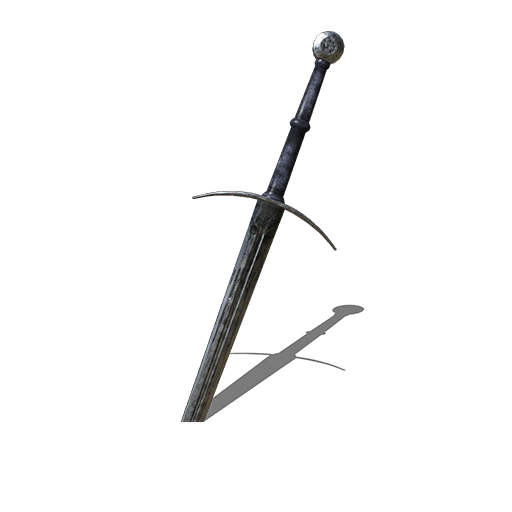 However, dual-wielded weapons are limited by the lowest of both strength and dexterity. 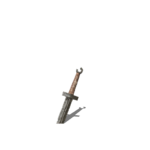 For example, an adventurer with strength 14 and dexterity 10 wielding two weapons may only use weapons that deal 1d6 damage or less. 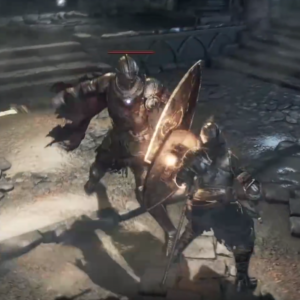 Further, dual-wielding prevents using a shield or any other off-hand item. When dual-wielding, both attacks must be rolled at once. Combatants may not save one attack for a potential parry (see below). When a critical hit occurs, players can choose to inflict either double or full damage. For double damage, roll the weapon die twice and then apply any other modifiers. For full damage, do not roll damage but rather use the highest potential result of the weapon die. For example, a critical hit with a longsword (a 1d10 weapon) will inflict either 2d10 or 10 base damage, according to the player’s choice. Natural 20s inflict critical hits, as do strong attacks, parrying counterattacks, and sneak attacks (see below). Successful strong attacks are critical hits. However, strong attacks leave the attacker open to counterattack, reducing the attacker’s AC to 10 (unarmored) temporarily unless the strong attack reduces an enemy to zero hit points, in which case AC is unaffected. Because of this, strong attacks are best used finish off enemies. Reduced AC from a strong attack persists until the adventurer that made the strong attack acts again. 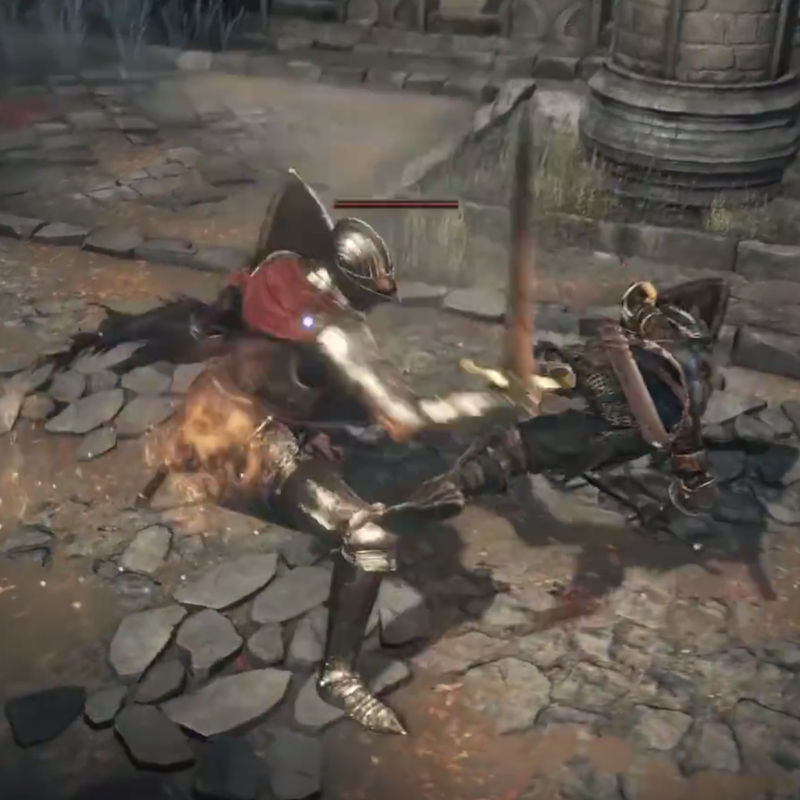 Rather than attack, a combatant may try to parry and counterattack. This requires waiting for an opponent to attack. 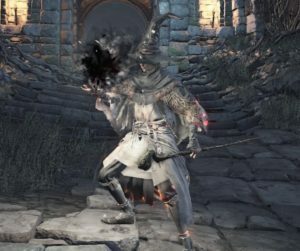 Resolve a parry with opposed attack rolls rather than static armor class. 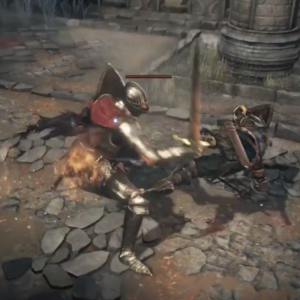 If the parry is successful, the combatant parrying inflicts a critical hit for taking advantage of an opponent’s opening. 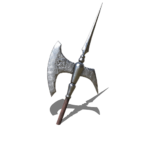 Parrying is only possible against opponents wielding weapons. Concealed adventurers may make sneak attacks with melee weapons. Sneak attacks are made with advantage and inflict critical hits. Melee weapons used for a sneak attack are limited by both strength and dexterity. For example, an adventurer with strength 14 and dexterity 12 may use weapons dealing 1d8 damage for a sneak attack. Following a sneak attack, successful or otherwise, make a dexterity check (with disadvantage if base AC is higher than 12) to determine if the adventurer remains concealed. Concealed combatants may not be targeted directly. 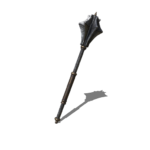 Blunt weapons (for example, caestus, club, and mace) are more effective against some enemies but are also more clumsy than other weapons. Exactly what clumsy means must be ruled situationally by the referee but may include occurrences such as striking after an opponent with a more agile weapon. Upgrade weapons during downtime by bringing special resources, along with personal essence freely given, to a blacksmith or enchanter. Weapons may be improved up to +5 and can be infused with other magical powers. Enchantment bonuses apply only to attack rolls, not damage rolls. Elemental enchantments modify the type of damage inflicted and can sometimes augment amount of damage. Special resources may be explicit external treasure but can also be harvested abstractly from defeated enemies according to the magical principle of similarity. For example, the essence of a monster that breathes fire would be useful for a fire enchantment. Record abstract essences in HD or level terms. Such monster essences do not occupy item slots. The process of improving a weapon links it to the wielder’s soul. Because of this, the original wielder suffers any damage the current wielder takes, making it unwise to lend your enchanted weapon to another. (Yes, this means that stealing an enemy’s linked weapon and cutting yourself is a strategy. Good luck with that.) The improvement process uses the personal essence to create the link between living soul and item. Such personal essence can take many forms. For example, blood, hair, or valued secrets. The details of the essence affects the weapon’s physical manifestation. 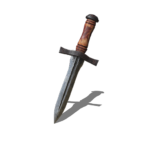 Since enchanted items draw their power from living souls, such items rarely persist beyond the death of their original wielder. 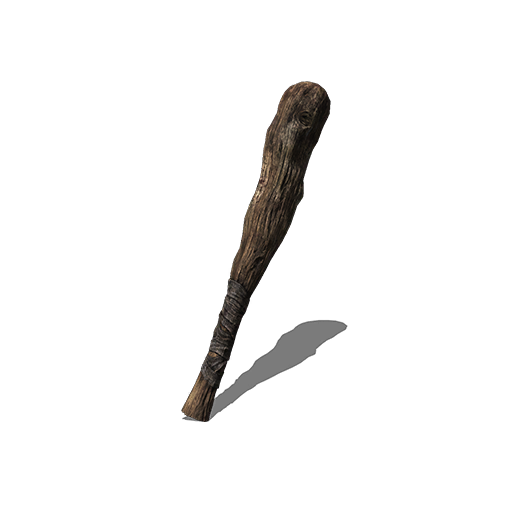 Rarely, a wielder’s power and personality are so strong that an enchantment is permanently burned into the item. Such legendary items are unique and sought after. A bleeding combatant suffers one damage per combat turn. Bleeding is easily staunched after combat. Some weapons, such as katanas, cause bleeding. Poison of the common variety inflicts one damage per dungeon turn and can only be cured by consuming an antidote. Uncommon and rare poisons may have other effects. Most poisons allow an initial constitution saving throw to completely resist the effect. In game design terms, bleeding and poison are fast and slow hit point attrition effects. 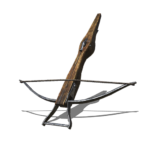 Crossbows can be used with a single hand but take an action to reload. 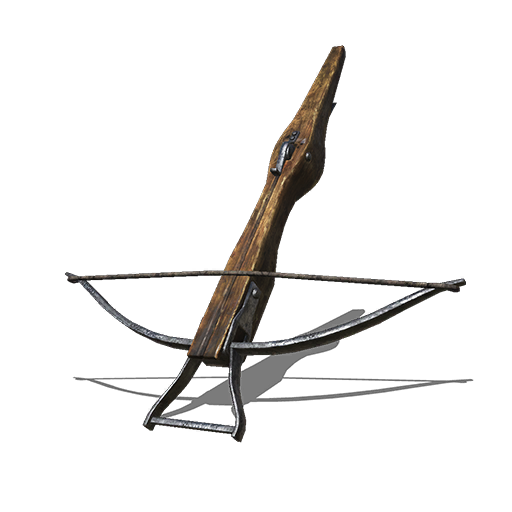 Bows must be wielded with both hands. 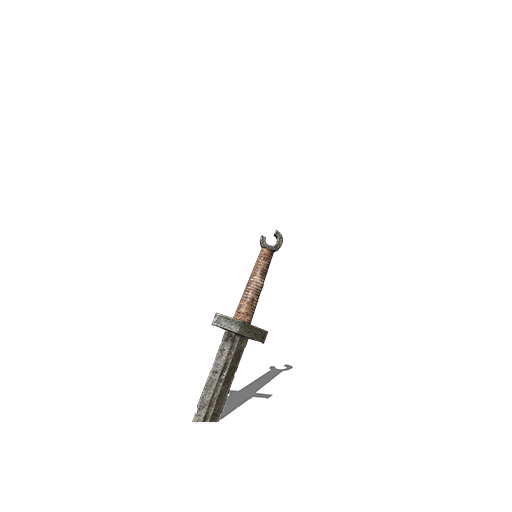 Weapon images are from Dark Souls 3. This entry was posted in Rules and tagged combat, Dark Souls, Stonehell on November 27, 2016 by Necropraxis. Adventurer playbook determines starting ability scores, starting HP pool, starting gear, and starting spells (when appropriate). Initially, I am developing four playbooks based on Dark Souls classes and one custom playbook. The four playbooks inspired by Dark Souls are Bandit, Deprived, Knight, and Pyromancer. The custom playbook is the Summoner and is based heavily on the OD&D summoner I posted before. Similar to Dark Souls, all adventurers sharing a playbook start with identical ability scores, as shown above. Players differentiate adventurers primarily through advancement choices during play though there are also a few choices per playbook regarding starting gear. I chose these 5 playbooks because they include a damage-oriented melee class (the Bandit), a defense-oriented melee class (the Knight), a damage-oriented ranged class (the Pyromancer), and a hard-mode class (the Deprived). The Summoner provides a magic-using class that relies on minions. The full list of potential playbooks includes Bandit, Cleric, Deprived, Hunter, Knight, Pyromancer, Sorcerer, Summoner, Thief, and Warrior. The playbooks of next-highest priority to me are the Hunter (for a non-magical ranged class) and the Sorcerer (for a more general magic-user). Most adventurer capabilities are determined by ability scores, which also have approximately the same bonuses (and meanings) as in traditional B/X. Ability scores are also used for traditional roll-under (<=) ability checks. Disadvantage, as in fifth edition, means to roll two dice and take the least favorable result. Strength and dexterity determine which melee and missile weapons (respectively) an adventurer my use without penalty, categorized by damage die, as shown in the table below. 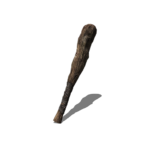 For example, an adventurer with strength at least 10 may use melee weapons that deal 1d4 or 1d6 damage. 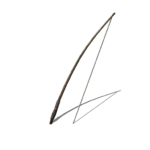 Adventurers may use weapons with greater die sizes, but make attack rolls with disadvantage when doing so and do not add ability bonuses. Constitution, in addition to adding HP to the HP Pool and functioning as an endurance or fortitude saving throw, limits the adventurer’s max AC. For example, an adventurer with constitution of 14 may wear armor that grants up to AC 14. Adventurers wearing armor granting AC higher than the constitution score make all physical tests (ability checks and attack rolls) with disadvantage. Unarmored AC is 10 (including for the Deprived, even though the Deprived begins with constitution of 9). Edit: the weapon upgrade rules replace the attack bonus. Adventurers have an attack bonus (determined by level). Add the attack bonus to attack rolls made when using a weapon that does not exceed ability score damage die limits. 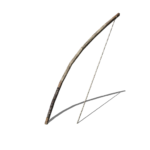 For example, an adventurer with strength 10 that attacks with a 1d10 weapon does not add the attack bonus (and in fact makes the attack roll with disadvantage, as described above). The attack bonus is calculated as level divided by two, rounded up, plus one (or consult the following table). Adventurers recover by re-rolling their HP Pool when resting in safety. Adventurers may equip several location-specific items (head, torso, left hand, right hand) and have an additional set of item slots equal to the strength score. 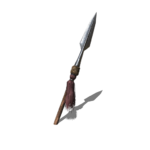 Some items may be bundled, such as throwing knives. Such items require only a single item slot up to the bundle limit. Bundle limits are determined by specific items. For example, the bundle limit of throwing knives is 6. Intelligence determines number of spells an adventurer can know (intelligence – 10, min 0). For example, an adventurer with intelligence 13 can know up to 3 spells. After casting a spell, an adventurer must make an intelligence check. If the adventurer fails this check, that spell may not be used again until the adventurer rests in safety. This makes the number of spell uses uncertain, but never less than 1. Charisma determines number of minions an adventurer can control (charisma – 10, min 0). For example, an adventurer with charisma 12 can control up to 2 minions. Commanding minions requires charisma checks in some circumstances. The charisma bonus applies to minion attack and damage rolls. To gain a level, spend coins equal to level multiplied by 1000. For example, to advance from second to third level, spend 2000 coins worth of treasure. Merchants are only interested in coins, gems, and precious artifacts. The focus of these rules is not on scavenging curtains and furniture from dungeons (not that there is anything wrong with that). Adventurers may advance in level wherever they can spend treasure, including deep within a dungeon, assuming the can find a merchant to deal with. When gaining a level, adventurers add 1d6 to the HP Pool, choose one ability score to increase by one point, and increase the attack bonus (for odd levels). The maximum adventurer level is 10. Ability scores may not be raised above 18. For moderate niche protection, I set playbook starting ability scores so that non-magical classes must dedicate one level of advancement to increasing intelligence before they can start learning spells. That is, advancing intelligence from 9 to 10 requires a level but does not grant any spell slots (since 10 – 10 = 0). The adventurer must then spend another level (increasing intelligence to 11) to gain the first spell slot. Advancing from 9 to 10 is not totally without mechanical benefit, even though it does not grant a spell slot, since saving throws versus magic use intelligence checks. 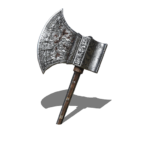 The strength bonus adds to melee attacks and damage. The dexterity bonus adds to missile attacks and damage (but not AC). The constitution bonus adds to the HP Pool. The wisdom bonus adds to miracle effects (to be discussed in a future post). The intelligence bonus adds to spell effects (such as damage). The charisma bonus adds to minion attack and damage rolls. All other resolution systems use simple ability checks. For example, reaction rolls are handled as charisma checks. Ability score bonuses follow the traditional B/X schedule of tiers made up of 13-15, 16-17, and 18. This entry was posted in Rules and tagged Dark Souls, Stonehell on November 23, 2016 by Necropraxis. On the frontier of the central kingdom, the High King Vollrath built a fortress in the mouth of a dusty box canyon. Though billed as a borderlands fort, the location was not strategic. The extensive excavation and heavily loaded provisioning caravans were out of all proportion with a mundane outpost. After completion, visitors slowed and then stopped. One day the gates closed and did not reopen. For months, lights and guards were still visible on the parapets, and then those too vanished. Years passed, and parts of the wall fell into disrepair. Nature began the gradual process of repossessing the edifice. Then, the High King was defeated in battle and unified kingdoms fragmented again. Locals assumed that the distant civilized Central Kingdoms had forgotten the fortress. A generation ago, those dwelling near the fortress began to behave strangely, gripped by unnatural passions. Many had nightmares. People regularly had bouts of uncontrollable rage or crippling fear. Settlers abandoned homesteads, soldiers sent to garrison outposts deserted, and trading outposts gradually became ghost towns. Soon, industry ceased. Most people that linger are mad or catatonic, though a few have managed to retain their selves. Even the sane are plagued by nightmares with uncomfortably similar details: dark tunnels, shriveled men scurrying on all fours like roaches, and glittering treasures. Drawn by rumors of wealth, some fortune hunters regularly trek from the now divided Central Kingdoms, assuming the dangers superstition. None enter the nearby frontiers without being changed. Even those not driven mad suffer tremors and strange uncontrollable emotions that intensify with distance from the complex, growing into an obsession with the abandoned fortress. Until they return, colors are dimmer, food tastes like dust, and nothing seems to satisfy. All return, many to die in the depths or to a madman’s cracked blade. Next up: B/X style playbook design inspired by Dark Souls starting classes. 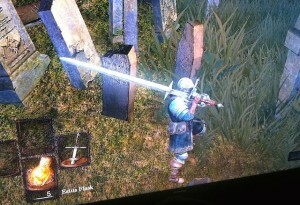 This entry was posted in Campaigns and tagged Dark Souls, Stonehell, underworld on November 21, 2016 by Necropraxis. Following is a designer note from the current working draft of Hexagram, the ruleset I have been working on. A player shall test once against an obstacle and shall not roll again until conditions legitimately and drastically change. Neither GM nor player can call for a retest unless those conditions change. Successes from the initial roll count for all applicable situations in play (Burning Wheel Gold, page 32). This means that once the players agree upon a particular test to resolve an uncertain outcome, the result of that one test fully determines the outcome. For example, a player may roll to determine if a character is able to open a lock. According to the Let It Ride principle, the player gets only one try to accomplish this goal using this means. Spending more fictional time for another attempt is not possible. 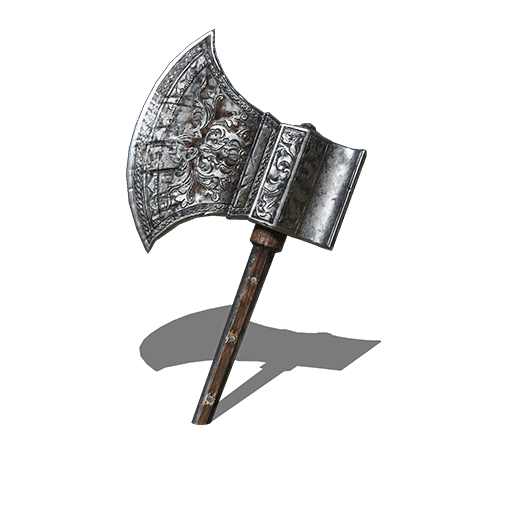 Players must consider other means to get past the lock, such as smashing it with a hammer that may come with additional unintended consequences. Hexagram play is based on a different game design principle: Push Your Luck. In Push Your Luck play, the number of attempts is not limited but risk attends each try. Additional tries tempt fate. In Hexagram, making Moves requires taking a Turn and taking a Turn requires rolling the Hazard Die and possibility of setbacks. In other words, potential mechanical reward entails potential risk. Part of the risk in taking another Turn comes from advancing fictional time. For example, taking a Haven Turn to recover could result in opponents gathering reinforcements, weather taking a turn for the worse, a political crisis, or a natural disaster. Though Adventurers may be making the same Moves, the setting does not remain static in response. From a general perspective, Let It Ride and Push Your Luck can be seen as two poles of a bipolar resolution finality spectrum. Let It Ride specifies that a resolution is final after one iteration while Push Your Luck specifies that resolution may be indeterminate. An Adventurer may fail to open a lock, take the outcome of the Hazard Die in stride, and then try again, repeating this procedure as many times as desired assuming the Adventurer remains capable. Various intermediate principles are also possible along this spectrum. For example, limiting the number of potential retests to some arbitrary number or requiring players to spend some consumable game resource to try again. Neither principle is inherently superior, but they do have different properties and structure play differently. In Burning Wheel, the purpose of Let It Ride is to continuously push the fictional narrative forward. Additionally, Let It Ride may encourage more diverse problem solving over time as probability suggests that a given means will be insufficient at least some of the time, forcing players to use alternative strategies. Push Your Luck leverages the psychology of temptation, assuming the uncertainty in question stands between players and their desires. By allowing players to take on greater risk in pursuit of outcomes judged important, Push Your Luck also lends weight and consequence to player decisions. This entry was posted in Speculations and tagged Hazard System, Hexagram on September 19, 2016 by Necropraxis.